Assassin’s Creed 2 is looking pretty nice. 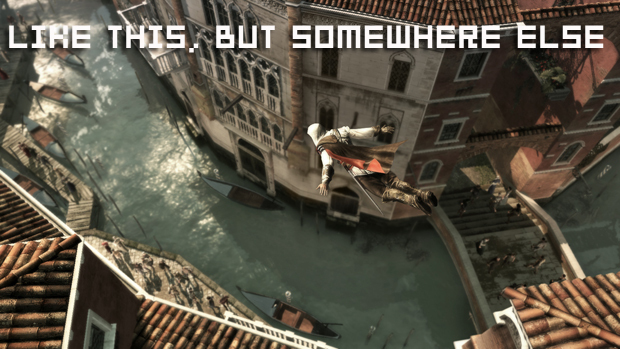 While the idea of Assassin’s Do These Same Tedious Missions Over And Over Again Creed getting a sequel didn’t originally thrill me, I have to say, the footage of Ezio Firenze gliding around on Leonardo da Vinci's flying machine started to warm me up to the idea. The double face stab didn’t hurt either. But Assassin’s Creed 2 isn’t going to be out until this November, which means that there’s still quite a while until we see how it turns out. Ubisoft must be pretty confident about its reception, though, since they’ve already gone and confirmed that an Assassin’s Creed 3 is pretty likely to be on the way. When asked during a video interview at E3, associate producer Vincent Pontbriand assured that Ubisoft is “of course” thinking about the sequel’s sequel. No specific setting has apparently been pinned down, but Pontbriand stated that it would need to be at a “pivotal moment in history.” Though it can’t take place before the events in the original game, apparently. He also says that there “are plans” for Assassin’s Creed 2 DLC, but was unable to go into any detail. So does this news actually surprise anyone? Both events seemed pretty likely, given that the first Assassin’s Creed sold quite well.